The proven Inductrix™ drone platform makes flying as enjoyable for new pilots as it is for seasoned hobbyists. 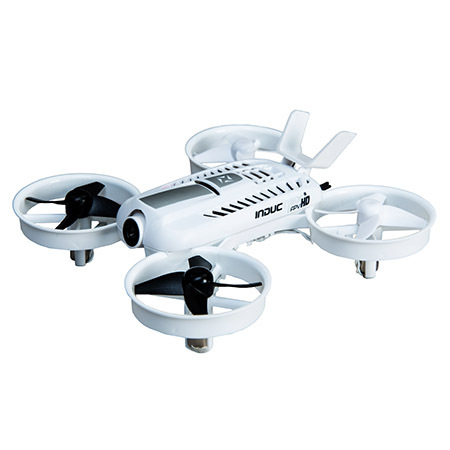 Four light, powerful brushless motors supply the oomph for snappy flights. The motors and propellers are mounted inside ducted fan style rotor housings, which help the durable frame bounce right back from ordinary impacts. But even during your very first flight, you’ll find it’s easy to keep control of your Inductrix™ FPV HD. That’s because innovative, sensor-assisted SAFE® technology gives it built-in stability. The drone can automatically maintain a chosen altitude; regain level flight on its own; and, if it lands upside-down, return to upright for another takeoff with just the push of a button. No worries…all fun!